RRP: £138.75 (+VAT). 57% OFF! 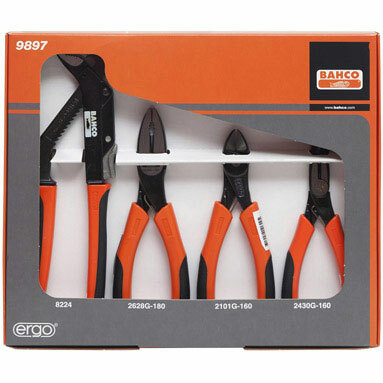 The Bahco 9897 pliers set is a superb value for money selection of pliers, with ergonomic handles. Bahco 8224 250mm water pump pliers. Bahco 2628G 180mm combination pliers. Bahco 2101G 160mm side cutting pliers. Bahco 2430G 160mm long nose pliers.